ETS Raters – Work at Home Scoring Tests! Published May 13, 2011 By Anna T. This post may contain affiliate links. Regardless, I only recommend sites I've researched and/or used and trust. 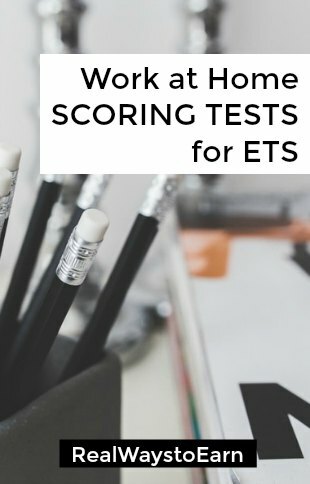 ETS (Educational Testing Services) is a company that pays people to score tests for various educational institutions both online and on-site, but in this post I'm going to focus on the ETS scoring jobs from home because it's an interesting way to make some money from home if you're qualified for it. The work you do for ETS is very similar to what you do for Pearson and other test scoring companies that I recently posted about. ETS has been around since 1947, and if you work for them, you'll have the opportunity to score all kinds of tests and assessments, possibly even SAT results. How much does ETS pay home raters? The pay rate varies depending on what tests you're scoring. Each type of test is considered a different project, and you have to apply to become certified for each one. Pay rates are not given on the website, but I found some info on Glassdoor that indicates pay may be around $15 hourly and that it was (as of early 2018) much higher — upwards of $20 an hour. So this company has recently done a pay cut, and most workers are very (understandably) unhappy about that. Still, this is an opportunity that could be considered more than just extra money. What you receive is comparable to what you might earn with a job outside the home if you're signing up for enough hours. But if you can't commit to ETS fully, then it would be great for extra money. The company will pay you for your training time, which is fairly short from what I understand. Typically about one day. Related: Here are some more companies that pay $10 an hour and up. How and when does ETS pay? ETS pays via direct deposit to your bank account twice monthly. They used to pay via paper check, but I'm not sure if they still offer this option. What are the requirements for ETS scoring jobs? As stated above, this depends on the tests you're signing up to score. The vast majority require that you have either teaching experience or some college. Your best bet for determining whether or not you can apply is to visit their list of currently available online scoring opportunities and read the requirements for each one. With most ETS scoring jobs, you have to pick out shifts to work, so this is flexible. You need to stick to the hours you commit yourself to if possible. Many projects require that you sign up for a minimum of four hours at a time for each shift. Browsing through the ETS reviews on Glassdoor from former workers, you'll see complaints regarding scheduling. Many former workers said shifts are inconsistent and canceled without notice. You work for ETS as an employee, not an independent contractor. They deduct taxes from your paychecks. Related: Don't want to be an independent contractor? These companies hire you as an employee. How do you apply for ETS scoring jobs? If you want to check out what ETS scoring jobs are available and start your application, you can follow this link to sign up. Additionally, I recommend checking out their FAQ here with lots more detailed information on the position. I'd also recommend reading through the comments below. You'll find lots of great insight into how this works. Looking for other companies that hire home-based workers in the education field? I am a paying member of a job search site called FlexJobs that focuses on home-based jobs and/or flexible work. They update their listings every single day, and hundreds of well-known, reputable companies use them for getting the word out they are hiring. It's only $14.95 a month to get a membership, and you can very easily cancel at any point. Use promo code AFFILPROMO to get up to 30 percent off that price! They charge because unlike other sites, they don't display advertisements and they can guarantee scam-free listings due to the fact they hire people to carefully hand-select every lead. You'll find home-based jobs in FlexJobs in every category you can imagine, including education. Go here to check it out for yourself. I started rating for ETS last fall. I was disappointed that I only got about 4 hours a month to work, even though I chose over 25 hours of availability. I stopped rating the first of the year, wasn’t worth only a few hours of work. I spent much more time testing than I did working. Although I identified very flexible availability, one month I had 12 hours of work and the next month 4. That is a complete waste of my time and I just ignored their contacts. The time spent testing and calibrating far out weigh the benefits of this gig. Hello, I just applied for a scoring position through ETS but it’s been 10 days and I haven’t heard anything – not even a confirmation that they received my application (although on the website it shows my application as 100% complete). I’m curious whether in other people’s experience it takes a while to hear back or not. Just put some information in. Let’s see how long. I am an SAT rater as well as a rater on several other tests for this company. I would not count on any monthly income from the SAT or any other tests administered by ETS. Shift cancellations are frequent as they often hire too many people for their needs each administration. Many people are lucky to get two days of work a week during the busy season. I don’t want to be mean but I would also not give out hints about passing certification exams here or ask questions about how to pass such exams as that is considered as violation of the TOS. Please stop asking for them. That is sharing confidential information that you should not share anywhere. You are given two tries to pass the certification exams. If you cannot pass either one, you will not be hired for that test. Ever. I passed the certification test and am going to begin scoring in October. I teach from home and am planning on scoring the test in the afternoon. Once you put in your schedule, are you saying that they will cancel the shifts once they are confirmed? I don’t want to short my hours teaching, I set my own schedule, and then have SAT hours taken away. Thank you. They cancel and cancel quite often. Confirmation does not mean they won’t cancel at the last minute or reduce the hours of a shift. Thanks Anastacia. I haven’t been able to work due to Hurricane Matthew and I have to say they have been great about me cancelling shifts. But I noticed today, which was the first shift I could work, that they took away a lot of my shifts for next week. Thanks again. Actually, I don’t think any tips are being shared that aren’t common knowledge. I read in the testing instructions to print out the Rubric. Everyone receives that info. As far as the hiring process, it is long and tedious. The training appears to include additional testing, so I hate to think that I’ve done this for a mere two nights a week or less. I am sure this process is done to ensure that there will be enough raters because many will drop out a long the way. I wouls like to take a test on SAT rater, but how do i get to the training page,plz can anyone help! Just go to Google and type in educational testing services and look on their website for test scorer jobs. It should give you a link to apply. You need a Bachelor’s degree and teaching experience helps. I am taking my certification test tomorrow. The hiring process takes a while and there’s a few steps. If you get to take the test, come back to this website and read the comments, they were helpful for me. Good luck! I failed my first certification test a week ago. My test consisted of evaluating 10 student essays (just like in the practice sessions). Those essays are based on a professionally written essay that students write about as part of their SAT testing. The same pro essay is used throughout the practice sessions, which makes it easier. The certification test took me less than 90 minutes. For most it should take one to two hours. I find evaluating these student essays difficult (especially when there’s a predetermined scoring precedent). BTW, I was never a teacher, but I do have a BA. I will try a second time. DId you retake the test yet? I am currently training as a SAT rater. What kind of score do you need to pass certification? Must all the answers be exact? Took my test 2 weeks ago and passed. But there was no score shown, just that I had passed certification. Took me about 30 minutes. I took my first cert test for an SAT grader on Saturday and failed. When I had taken my practice test, I had 80% exacts and 20% adj with no discrepancies. I was shocked when the box appeared stating that I had failed. I sat on hold for a half hour on Friday and a half hour yesterday wanting to talk to a trainer or team leader. I really need this job and I find it rude that they do not tell you what you need to score in order to pass. I cannot get a hold of a human being to talk to. Taking my test again this evening….hoping to do something better than I did on Saturday! I called ETS as I too had failed the first test. I was advised they give no information regarding the status of how you scored or what the passing rate is to pass the certification. I took the second test yesterday and have no idea if I passed or not, as the message said you will be contacted in 7 days regarding your results. When I took the first test and called, the person on the phone said that it should’ve told me immediately if I passed, it didn’t. I am assuming I failed again. I have scored this test for Pearson for the last 6 years and always kept a high score rate and speed. I used the rubric and the prompt and felt I did much better the second time around. Good luck with your second certification test. I am dissapointed in myself that after six years I will no longer be able to score. Took my second TOEFL Independent Writing certification today, but failed it. My scores were “exact” on the practice test, so like many of you I have no clue what I’m doing wrong in the 15 question certification exam. Two weeks ago, I passed the Integrated Writing certification on the first try. Both have very similar rubrics, but somehow I’m off with this one. I’ve asked for further training material or practice tests, but had no response throughout the past week. I can’t imagine that, considering all their focus on “calibration” that they wouldn’t continue training to get raters up to par. Hey can someone give me some advice on how to pass I just took the test but failed. I’m unsure of how this thing is actually rating even went doing the practicum. what should I do for my possible second attempt. I passed the certification today, but went into it feeling a bit unsure. I printed out the Rubric and the American Dreams Prompt. I studied both and highlighted key points in the Prompt. When answering, I really focused on the Rubric and responded following those guidelines. Initially, it was a bit of a challenge for me because as a grant writer, I was scoring based on what I thought was correct, but as someone said below, just answer using the Rubric. If I were doing this over, I’d spend more time on the last two training tests; the certification practice tests as they are more like the actual certification test. Good luck. Overall, I think there are a lot of steps to the hiring process. It’s ok I didn’t pass. I tried my best but it was rather confusing to figure out which way to go. I was testing for the SAT. That’s the only ETS certification test I’ve taken thus far. I recommend printing out the rubric and studying it. I also printed and highlighted the prompt to refer to during testing. I found it easier than referring back to it when reading responses. I just passed the certification and the best advise I can give you guys is to only reference the scoring guide for the correct score. Go by those rules and you can not go wrong. If you think what the score should be, you are taking the test wrong. Follow the guidelines for each response, reviewing each scale (1-4) for RAW. While practicing, often I would just select the score that made sense to me, but when I stopped thinking and just referenced the guide I did fine and passed. I received instructions to take the test to certify. How long does it take to complete the test? I read that you have 16 hours to complete it, but surely doesn’t take 16 hours to test. The instructions they provide are very confusing. Thanks. I trained yesterday and took my certification this morning and passed. The indicated someone will contact me within seven days for next steps. Hi. Can you share how the final passing score is calculated for certification. Do they look only at the Exact % or do they combine Exact and Adjacent % for the final score, and what score is required to pass certification? Hi Pam, I recently took the certification and passed. It was for the SAT rater and the practice tests were a bit difficult to me so I was nervous about passing the certification. I don’t know if the certification process is different based on what tests you are going to be scoring but this was my experience: My certification test had 10 items…mixture of easy medium and hard…you score it and once you finish…immediately it will tell you if you passed and as the previous poster June stated..it just simply stated..Congratulations you have passed.. someone would contact you within 7 days…. It did not give any details of my certification test as far as my final score…what I got wrong/right…the % of exact and adjacent…totally nothing. So..I do not know what the passing score is…unfortunately. Since I had a hard time with the practice tests I decided to do the following things to help me with passing the certification: Don’t think about how you would score the papers…you need to think “how would ETS score”…and when it doubt…go for the middle ground of scoring…if you think something should be a 2 but think that ETS would give it a 4…grade it a 3. So if the paper is really a 2 or 4…there would only be a 1 point difference which goes into the Adjacent percentage. Its better to be Adjacent then to be totally wrong if that makes any sense. If you can..print out the scoring rubic…reread it several times..take note of how the practice papers were scored and why and again…compare it with the scoring rubric. Thank-you so much Stacy, I’m taking it tomorrow and am nervous. I did fairly well on Friday, but missed a few on the “analysis” category (I seemed to equate reading comprehension with analysis, so I will be more careful) Your tips will be very valuable to me in the morning! The information above was extremely helpful about going to interactive training, paying attention to bench marks and learning the rubrics. I do not believe it is a measure of our academic training and skills but the certification process is so you can become familiar with ETS standards of scoring and correctly applying ‘their’ rubrics, so that you are interpreting them the way ETS does. This is based on the helpful information that I read on this page and research. I will probably be taking the test in a few weeks, and the best way to prepare is to read the job description carefully and be able to follETS guidelines and standards for scoring. I guess this all may be an educated guess, I am a researcher with an MA, so I think I know what to expect. When I get the training materials, I will re post and hopefully provide feedback that may be helpful to others! Agree totally with Stacy. To add, I got paid for the one day of training last Friday since my first day of training was the 10th (last day of pay period). My certification day pay will be on July 1st just to give you an idea on pay schedule. You can also call payroll and they will send you a pay calendar via email. Another mention is that they emailed me the next day after certification and indicated that October will be a high volume month and they will be reaching out to scorers in September for availability. SAT will not score in July, August and September for 2016. You can submit hours for June but you will only be considered for the remainder of June if they require additional raters. I took the training all day today I have three Masters degree from Columbia University I am also a Depart head and I did very well on the training but failed the certification I will try once more tomorrow but this is just not a good test of our academic skills. Hey, could someone on here reach out to me and give me some pointers? I scored mostly exacts and adjacents for the SAT training, with 1-2 discrepancies, and when I took the certification I found it seeming easier than the training passages, and then was shocked to find that I did not pass my first attempt at certification. I really need this job to work from home while taking care of a disabled family member on a livable wage, so any help someone can give me to just pass the certification process would be eternally appreciated! The exact thing just happened to me, I did good on the training, but failed my first attempt. Scared that I will mess up the second one. Shawn, were you successful at your second attempt? If so, are there any pointers you can give. I’m currently waiting to be assigned a date for my second attempt. It would be greatly appreciated. How did you do on your second attempt? I tried to certify yesterday and was confident that I passed. I failed, and was seriously shocked. I’ve enjoyed the training and scored mostly exacts or adjacents on the training essays. I think I’d really enjoy this job. I am scheduled for my second attempt today and I too am scared that I will mess up. Do you think they take the time spent scoring into consideration? I agree. The certification seemed easier and I did very well on the training. I took my time and reviewed the rubric with each essay, but failed the certification on the first attempt. It would be nice if they state whether or not they are looking for all “exacts” or even post the grading criteria for the certification. Hopefully I will past the second attempt or qualify for another rater opportunity. Does anyone know if the references you listed on your application to ETS were actually contacted via email or phone? I failed my 1st attempt at certification and of course there’s no feedback. Do you know how many you have to get exact? I felt I did pretty well during the training, I had a high % of exact and adjacents and only 1-3 discrepencies. I get to take the certification twice. The training gave me no hints on how to score the essays so I am scared. Maybe I was in the wrong area for training. The training I saw only showed me the scoring module. Is there a specific area I should select?? I completed mine over the weekend. it wasn’t what I “thought” it would be. When I clicked the training tab, it really just took you straight to various modules and you start to “practice” immediately. I did print off the rubrics and look at the “benchmarks” before I did the training. I think that helped. I took one day for the training and the following day, I reviewed a bit and took one of the practice tests. Then I took the real one. I passed. I honestly think had I taken all of the practice tests I would have been too burned out to focus on the real one. Chan, my application was just approved, but I have a question that I could not find everywhere. Can you tell me how many hours per week you can work? I want to work as many hours as possible. I did great on the practice tests. Only got 1 discrepancy. i ended up failing both certification tests. Then it says they’ll contact you within 7 days with the next steps. what happens now?!? i have no idea what even went wrong. have any one of you failed both tests and were still able to work for them?? For Michelle and others trying to train and certify for ETS online rating: When you click on the Training tab, choose the Interactive Training link. If you want examples of scores, click on Benchmarks before you atempt any training or anchor sets.There is also a tab for the Scoring Guide. You can also refer back to the Benchmark and Scoring Guide tabs as you score. After you assign a training or anchor score, pay attention to not only the scores that ETS assigned it, but their scoring notes explaining why the score was assigned. Hello! Thank you for sharing this information! I am waiting on my I9 documents to arrive. I am curious about how many hours one is allowed to work as a Redesigned SAT rater. I would greatly appreciate any information you can share with us! Thank you so much. I did poorly for the SAT scoring certification, but I did certify for two other ETS rater tests. I also had an ETS person call me about modifying the website to make the training more efficient. I saw that they added more documentation to help you find those tabs now too. I am also having difficulty passing SAT certification. I trained for a full day and a half and did not pass. My training scores were very good with a few adjacent and discrepancies. I utilized the benchmarks and thoroughly read scoring notes. It’s quite difficult to gauge where weaknesses lie without some feedback. I’m concerned that I may not pass on the next attempt and not sure what to expect if that occurs. I passed the SAT certification and I wondering if it really takes them a week to contact you about next steps and what the next steps are. I want to get the $100 bonus they are offering but I need to get in 60 scoring hours by May 26th. I am trying to become an ETS rater. I attempted training today, but I found the website for training confusing. The links I chose were almost all the same even though they had different names they all had the exact same content. I thought there must be a software glitch. None of them showed me what ETS considered to be a level 1, 2, 3, or 4 essay. It was very frustrating. Can anyone recommend a specific link for training within the site for my second session? I don’t want to fail the certification. Certification makes you grade 20 essays so I have to know the expectations for each essay, not just how to use the software. That is all I learned today. I work for ets as a work from home scorer, and I do like it. The job does not provide benefits to the online scorers however the pay is worth it. The training for this job, they give you 2 weeks or so to go through the tutorials and then you have your first attempt at certification. If you fail you receive a second attempt. You are paid for both of those. Pay is based on what test you score. Thanks so much for your feedback and taking the time to share it, Becky! Can someone who worked for ETS tell me how long their training period is (daily, how many hrs and if it lasts one or 2 months). Thank you. Scoring for ETS really depends on which project you’re assigned. POSITIVES: I’ve had friends work on certain projects and have a fantastic experience. They pay for the training phase, and I was paid on time. NEGATIVES: My scoring assignment was a horrible experience. I have a Master’s Degree in English, have taught at the college level, and have taken graduate level courses in assessment (basically . . . how to structure exams). The test I was assigned to score was the writing portion of a specific state’s graduation exam for high school students. It had an ineffective rubric, and I couldn’t stomach assigning ratings to students, knowing that my score was going to determine whether they graduated from high school or not. Scorers are assigned a coach, and mine was clueless. He did nothing to help me figure out how to work within the established rubric. Instead, he said something like, “Well, we don’t write the test questions or develop the rubric. The specific state does that on their own, and we just score the test.” Thinking perhaps the terrible rubric was a one-off situation, I resigned from the project and signed up to rate a different exam. It turned out to be the 7th/8th grade exam from the same state. Guess what? Same exact rubric! I quit immediately, collected my wages for the training portion, and haven’t looked back. My suggestion is to apply, go through the training, and see what exam you’re assigned. Perhaps you’ll get lucky and have a strong writing prompt, clear rubric, and satisfactory experience. If you don’t, please contact Pearson and tell them *why* you’re quitting. Go on record with your experience. Thank you so much for sharing your experience! I also think I would have a hard time grading tests when I knew that the grade I gave would determine something as important as whether or not a person could get their diploma. Comments like yours are exactly what I need, and I really appreciate it. People need to be aware of both the good and the bad when it comes to different opportunities. Oops, just caught that you said “contact Pearson.” So this was with Pearson and not ETS? Ack! Yes, Pearson. Although they partner on some projects. It’s sometimes difficult to distinguish between the two : ). I wondered, too, if they offered benefits, but I couldn’t find any information on it. Maybe someone who works for them will eventually chime in here with some info on that. As always, this is a great review! I wonder since they hire as employees if they offer benefits. I am confused on the new law passed that everyone must be offered insurance…I wonder if that holds true for people who do not work a full time schedule. Also, I wanted to point out how great it is that a company who lets you choose your schedule also hires as employee!! Thanks!